In plant breeding programs, screening for drought-tolerance is often a bottleneck. An experiment was conducted in the field and rainout shelters to: (1) identify physiological traits in breeding programs that can be used as criteria for selecting drought tolerance soybean genotypes [Glycine max (L.) Merr], (2) evaluate genotypic differences to drought tolerance, and (3) identify genotypes with superior drought tolerance. Sixteen genotypes were evaluated in split plot design under irrigated and drought conditions. 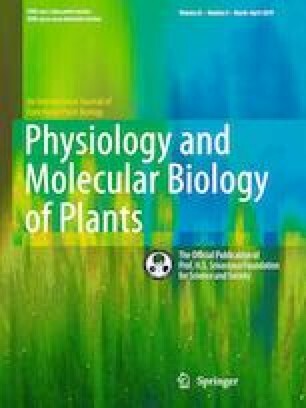 Various physiological traits were measured in irrigated and drought stressed plants such as canopy temperature, root length, specific leaf weight, photosynthetic rate, chlorophyll, and epicuticular wax content. As compared with irrigated conditions, the percent reduction in mean soybean yield under rainout shelter was 40%. The mean yields of soybean genotypes ranged from 1162 kg/ha (NRC 12) to 2610 kg/ha (JS 335) under irrigated conditions, whereas, under water stress conditions, yields ranged from 852 kg/ha (Samrat) to 1654 kg/ha (EC 538828). Genotypes EC 538828, JS 97-52, EC 456548, and EC 602288 had better avoidance to drought than other genotypes. The superior drought tolerance of the four genotypes was related to their low canopy temperature, deep root system, and high values for root/shoot weight ratio, specific leaf weight, chlorophyll content, photosynthetic rate, epicuticular wax content, and Photosystem II (PSII) efficiency. Therefore, when genetic diversity of these physiological traits is established in breeding programs, these traits can be used as a selection criterion for selecting drought tolerant genotypes. The online version of this article ( https://doi.org/10.1007/s12298-019-00665-5) contains supplementary material, which is available to authorized users. The authors acknowledge funding for this work from Indian Council of Agricultural Research.